There’s something about this time of year that makes you reach for the shades most wouldn’t on an average day. I’m talking about your gold glitters, holly-esque greens and metallic tones which are swapped for the every day work-friendly neutrals. Rightly so, too, as it is Christmas after all. 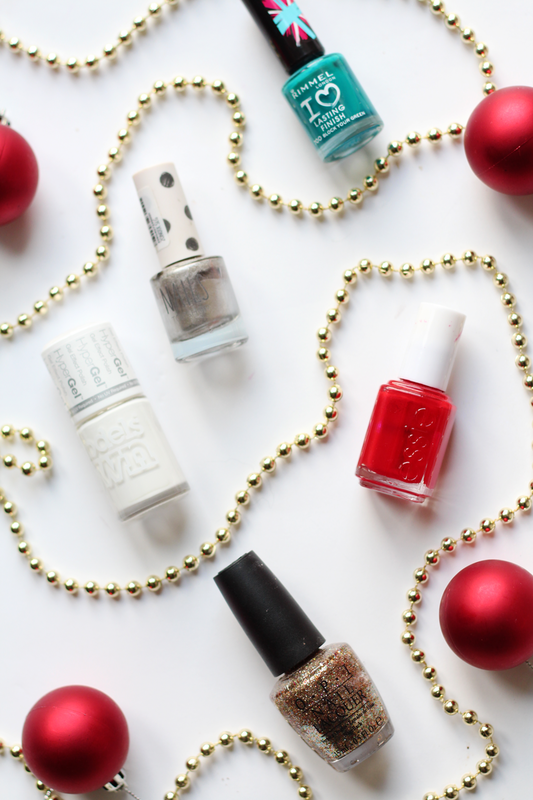 I personally love all the polishes you can happily don as part of the festive season, so I’ll run through my top five. Starting with those that are clearly asking to be used in some sort of nail art, I always have to crack out my reds, greens and whites. 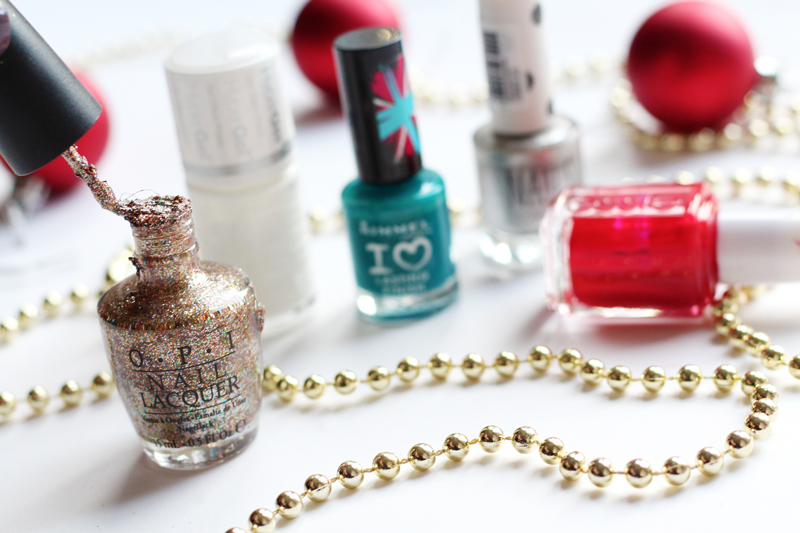 Holly nails, anyone? I love using Models Own HyperGel Polish in White Light as a pure white base for any designs, or just for a solid snowy day-to-day look. I tend to opt for Essie Aperitif throughout the year, but there’s something special about a red nail at Christmas and this is my favourite all time red. It’s just the perfect red tone, not too dark, not too bright, just ideal. If you fancied resembling an xmas tree this year, then Rimmel 60second Polish in Block Your Green is a great one to go for. It’s darker than it looks in the pictures, but offers a really chic take on a colour that a lot find really hard to wear. Of course, we have to discuss the glitters and the most stand out one I have is definitely OPI Bring On The Bling. It’s a little harder to get hold of now as it was released as part of a 2010 collection, but there’s loads like it out there. It’s a great warm toned gold, with lots of multi-coloured flecks in it and looks amazing on the nails. Finally, I do love an icy metallic so I’ve opted for Topshop Silver Bullet (similar), as I think it makes a good alternative to gold and looks really pretty on!